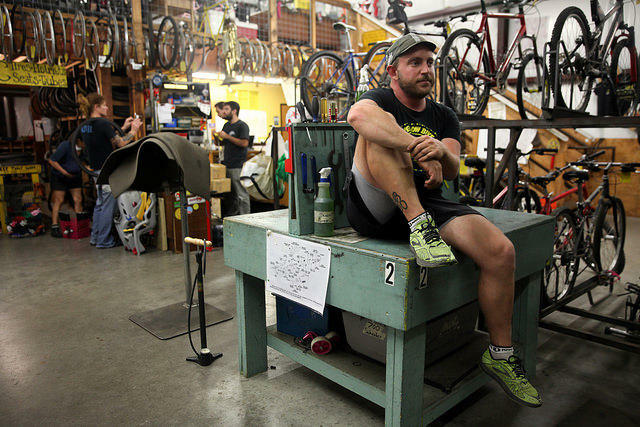 A cyclist gets ready for Austin's Thursday Night Social Ride. We've all felt Austin's growing pains: traffic, high rents, rapidly rising home values, and the higher property taxes that come with them. And we tend to drown these pains in queso and beer, so we're probably putting on some weight, too. But what if there were an easy way out of all of this? Some Austinites, like Mike Melanson, have found one. "A congestion-free way of getting around, a way that doesn't cost me money, a way that helps my health," he says. For much of the last ten years, he's relied on a 19th century technology to move about Austin: the bicycle. Mike Melanson writes the blog 'Austin On a Bike' and volunteers with the Yellow Bike Project. Yellow Bike Project (YBP) is a volunteer-powered initiative to put bicycles on the streets of Austin and Central Texas by operating community bike shops, teaching bike mechanics and maintenance, and acting as a local bike advocacy group. "Really, in the last five years, we've seen a pretty major transformation, where the city has started to really embrace the benefits of cycling," says Miller Nuttle with Bike Austin, a cycling advocacy group. It's a refrain you'll often hear when you talk to Austinites on bikes these days: Things have really improved in recent years. Since 2009, the number of miles of bike lanes has nearly doubled, now totaling over two hundred miles. "This is a real shift in our strategy. It's not really about what we can do for biking, but what biking can do for us," says Laura Dierenfield, manager of the city's Active Transportation Program, which focuses on moving people around by bike, foot and transit. What biking can do for Austin, Dierenfield says, is move more people around — for a lot less money, construction and maintenance than cars require — while reducing environmental impacts and improving health. She says of course not everyone can bike everywhere all the time, but the city does want more people to bike, more often. 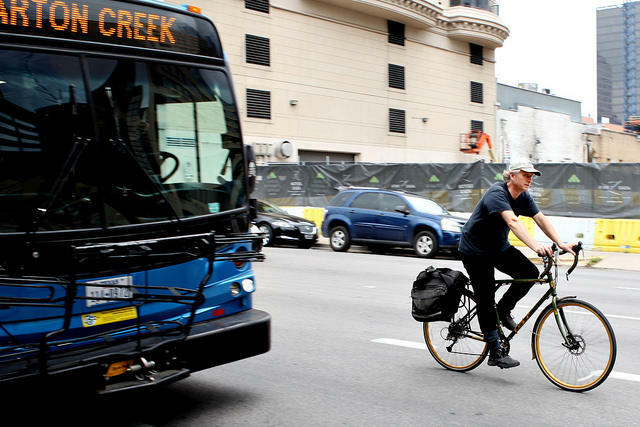 A cyclist rides on Guadalupe Street in downtown Austin. One step towards this goal is Austin's new Bicycle Master Plan. It envisions all sorts of biking and walking improvements across the city, including a comprehensive, all-ages bicycle network of lanes, tracks and trails. The plan carries a price tag of $151 million, with two-thirds of that going toward nearly 50 miles of new urban trails (the same ones in the city's recent Urban Trails Master Plan), and the other third toward another 200 new miles of on-street bike facilities. But it's going to take time to implement, and there isn't funding lined up for a lot of it yet. The city has done surveys on what it can do to get more people biking, and the plan reflects what those surveys found: People want better protected bike lanes. The plan envisions plenty of those, and focuses on getting people to choose bikes more when they have a shorter trip to make. "Where are the short trips?" says Dierenfield. "Where are there those three-mile or less trips, where people would like to bike, or could feasibly bike if given the facility to do so?" If the city can build out the bicycle network, the payoffs could be substantial. The bicycle master plan forecasts that once the network comes together, it will get enough people on bikes to equal taking 20,000 cars off the road every day downtown, a seven percent reduction from current levels. That's double the amount of cars the failed $1.4 billion urban rail plan was projected to take off the road, at a tenth of the price. Cycling advocates recognize bikes are just one of the many options and solutions for dealing with the city's traffic and affordability issues. The city needs a "silver buckshot" of options for getting around, not one transportation silver bullet, Dierenfield says. But if biking becomes a more feasible option for more Austinites, it will save them and the city money. "We recognize that there are people, you know, who are further out, or people with mobility issues, that just have to drive," says Nuttle with Bike Austin. "And that's totally fine. I think cars are also part of the solution, in moderation. But by creating options, you get a lot of the people out of your way, basically, who are on the streets." Nuttle also says a change is due in how we perceive each other in Austin when it comes to transportation. "Seeing other people on the road as people," he says. "It's a person on a bike, it's a person in a car, it's a person on foot. We're all Austinites, we're choosing different ways of getting around." 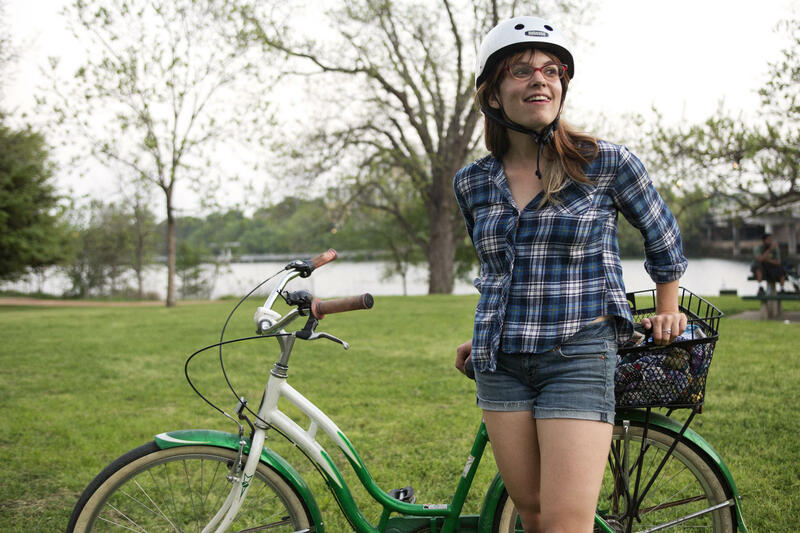 And with hundreds of miles of new bike lanes, better connected trails and a successful bike share system, you can expect to see a lot more Austinites choosing two wheels to get around instead of four.